around the Gulf of Mexico, particularly Florida’s “other” keys: Perdido, Cedar, and Lido. Whether you are an armchair traveler or an explorer looking for new adventures, we think you’ll sail through the pages of this issue with a smile and maybe a touch of wanderlust. Happy reading! Viking’s Danube Waltz route along Europe’s Danube River includes everything travelers hope to see: historic buildings and landmarks, castles, and scenic panorama views like this one in Dürnstein, Austria. Photo courtesy of Viking Cruises. DeSotoMagazine.com ©2019 DeSoto Media Co. DeSoto Magazine must give permission for any material contained herein t o b e re p ro d u c e d i n a n y m a n n e r. Any advertisements published in DeSoto Magazine do not constitute an endorsement of the advertiser’s services or products. 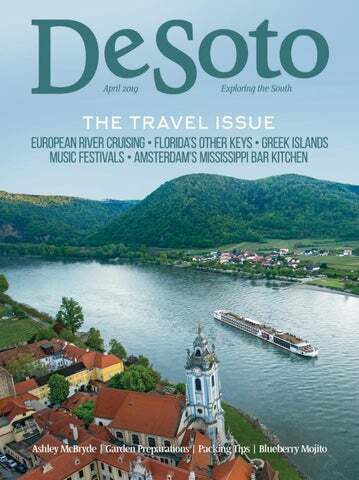 DeSoto Magazine is published monthly by DeSoto Media Co. Parties interested in advertising should email paula@desotomag.com or call 901-262-9887. Visit us online at desotomagazine.com. Andrea Brown Ross is the assistant editor for DeSoto Magazine. She lives in Como, Mississippi. An Easter staple, decorated eggs are found in many variations across the world. The timeless tradition is still a popular and sought-after art, and not just on edible eggs. Two Southern artists have found a way to make their colorful decorations more permanent. In an ancient Ukrainian tradition called Pysanky, eggs are decorated with traditional folk designs using a wax-resist method. Pysanky originates from the Ukrainian verb pysaty, which means “to write” or “to inscribe.” These designs are not painted but written in beeswax. Beginning as a pagan custom, the eggs were given as gifts full of symbols that represented a good harvest, good weather, fertility and other good fortune one might wish a friend or relative back when farming was a necessary part of survival. When asked about the color in her designs, the Ridgeland, Mississippi, artist says, “I have a loose style of painting and I love lots of color. I paint in mostly acrylic and acrylic mix but do dabble in some oil paints every now and then. I like the versatility of acrylic painting and am the most comfortable with that medium.” She doesn’t commit to a style or genre of art. “I feel like my style is ever-evolving, and I enjoy learning techniques from other artists,” she says. Ta y M o r g a n’s w o r k i s available in boutiques, including The Other Side gifts in Senatobia, Mississippi. Owner Anita Moore says, “Tay Morgan’s calendars and eggs are a must have every year. We have repeat customers who love to give them as gifts and keep one for themselves. Her artwork is beautiful and the scripture is encouraging.” TayMorganDesigns.com Michelle Keller is a freelance writer based in Memphis. She also writes for The Austin Times, On The Links Magazine and National Hardwood Magazine. If you are traveling across the South, you may want to pick up a copy of ‘This is My South’ for a comprehensive list of places to go and things to do. Travel blogger and writer Caroline Eubanks leads the kind of life most people dream about when they are strapped to desk jobs. Since graduating from the College of Charleston in 2010, she has volunteered in Thailand, sailed in Croatia, scuba-dived in on the Great Barrier Reef, and road-tripped throughout the South. Along the way, she found work as a freelancer and established two award-winning blogs that documented her travels. One of those blogs, ThisIsMySouth.com, led her to write a guide book, called “This is My South – The Essential Travel Guide to the Southern States.” She started the book after she came home from working a year in Australia. 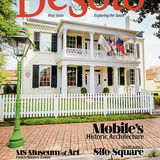 A native of Laurel, Mississippi, Mary Ann DeSantis is the managing editor for DeSoto Magazine. of Food and Agriculture. The Mississippi State University Extension service in Hernando offers routine soil testing for $8. In Tennessee, soil sample boxes and sampling instructions can be obtained from local University of Tennessee Extension offices or online at ag.tennessee.edu/spp. “It’s really helpful knowing what to add to your soil,” Haley says. Once your soil is prepared, you are ready to plant. When deciding what to plant, Haley recommends rotating your crops each year. “By putting a different plant in that spot, you’ll get some different nutrients being pulled from the soil,” he says. For instance, if you planted tomatoes last year, put in peppers this year. By doing so, the soil can stockpile the nutrients tomatoes need, meaning they’ll be available when you plant tomatoes in that spot next year. Haley says plants that yield well include Sweet 100 tomatoes (similar to cherry tomatoes), sweet banana peppers, chili peppers and jalapenos. According to the MSU Extension service, plants such as okra, beans, cucumbers, eggplant, squash and watermelon also will do well. “Peppers would be great,” he says. “Corn and beans could be OK in a smaller garden.” To help you find the right plants for your garden, check the tag that comes with the plant. For instance, Bonnie Plants, which is a very popular brand that supplies many local garden shops and nurseries with plants, includes a tag that clearly states how much sun the plant needs, how they should be spaced, and the planting depth required. It also provides a timeframe on when to expect the plant to mature. Also, don’t be afraid to try new additions to your garden. In fact, Haley recommends using an 80/20 rule for your garden: 80 percent of familiar plants and 20 percent of somewhat experimental plants. “It could be a hybrid of something you plant regularly,” he says. “See if it works better than what you have been using.” For example, many gardeners plant cucumber vines each year, but maybe this year you try a cucumber bush instead, Haley explains. You may find you have a larger crop or you prefer the taste of bush cucumbers to vine cucumbers. For those who don’t have a lot of space for a traditional garden, or maybe don’t want to invest in a larger garden, container gardening can be a great way to grow fresh vegetables without taking up a lot of room. Tomatoes, peppers, eggplant and even cucumbers do quite well in properly maintained containers. When choosing your containers, make sure they are large to allow room for root growth. Also, choose containers that drain well so water does not collect in the pot, resulting in mold or mildew on the roots. “You do have to water more often than in the ground,” Haley says. “[Containers] dry out so much faster. Beware it will wash nutrients out, so you’ll need to supplement that as well.” You can do this by using a plant food specifically for vegetables. Also, if the forecast calls for rain several days in a row, be prepared to move your plants under a covered space to limit water intake. Plants will need at least six to eight hours of direct sun in order to thrive, so choose a location accordingly for your containers, However, Haley warns against placing any plants (or garden) on the west side of your house, given the hot afternoon sun could burn plants. Having a garden filled with fresh vegetables is one of summer’s best pleasures. By planning ahead, you can enjoy the fruits, er, vegetables of your labor year after year. Karon Warren is a freelance writer based in Ellijay. Georgia. A graduate of the University of Southern Mississippi, Karon also writes for FamilyVacationCritic.com as well as her blog, ThisGirlTravels.com. Judy and Len Garrison are freelance travel writers and photographers from Athens, Georgia. Known as Seeing Southern, they travel the world in search of the story behind the story. Hangout Music Festival May 16-19 Gulf Shores, Alabama hangoutmusicfest.com When the Hangout Music Festival kicked off in 2010, it was clear the new kid on the block was looking to compete with the legendary, multi-day Southern concerts, like Tennessee’s Bonnaroo. The first Hangout Fest was a smash success, bringing in some 15,000 thousand revelers each day to Gulf Shores to see performers like John Legend and Phish’s Trey Anastasio. The concerts were the draw, but so was the venue – a gorgeous beach on the Gulf of Mexico. “Hangout Fest is a vacation,” says Sean O’Connell, the festival’s director. “You come for the music and you get swept away by the beach and experience. There’s nothing like it.” According to Kay Maghan, public relations manager for Gulf Shores & Orange Beach Tourism, 40,000 people now take to the beach every third weekend in May for the threeday Hangout Fest. The event continues to feature a rousing diversity of musical genres, from hip hop to rock, electronic dance music to bluegrass. There are plenty of other diversions – from a roller disco to a puppy kissing booth – if you can tear your eyes and ears away from the 75-plus live acts playing on five stages. Hangout Fest 2019 will offer the same kind of can’tmiss lineup as its predecessors, with Cardi B, The Lumineers and Travis Scott appearing. There are a range of ticket packages on sale now. Bonnaroo Music and Arts Festival June 13-16 Manchester, Tennessee bonnaroo.com With its hippie heart and jam-band love, Bonnaroo Music and Arts Festival owes an inspirational debt to Woodstock and other concerts of the 1960s and 1970s. Situated on a 700-acre farm in Manchester, Tennessee, the four-day celebration offers live performances on more than 10 stages, as well as an artisan market, comedy tent, yoga, a 5K run, parades, and much more. There is camping onsite, too, lending the whole thing a festive, familial vibe despite crowds that have topped 75,000. But Bonnaroo is most famous for the caliber of performers who appear; blockbuster acts in previous years have included U2, Bruce Springsteen, Paul McCartney, Stevie Wonder, Billy Joel, The Allman Brothers Band, and Willie Nelson. This year’s event will feature more than 150 acts, including Phish, The Lumineers and 2019 GRAMMY winner Brandi Carlile. There are about as many ticket packages available as there are performers, and according to Brian Wagner, assistant commissioner for the Tennessee Department of Tourism Development, those tickets “are purchased in all 50 states and more than 40 countries, making Bonnaroo a global event. For nearly 20 years, Bonnaroo has featured the biggest acts in music along with up and coming artists in a setting featuring art installations and the natural beauty of Manchester for an experience that could only be made in Tennessee...We are proud to have Bonnaroo as a valuable tourism asset in Tennessee.” Jill Gleeson is a travel and adventure journalist who has written from Woman’s Day, Country Living, Washingtonian, Gothamist, and more. Find her at www.rebooted.com. 8:30 Breakfast at Baristas Coffee Bar located in historic Marquette Tower. Enjoy one of their handcrafted iced coffees, smoothies, teas or lattes. Breakfast offerings include buttermilk beignets, avocado toast or breakfast bowl with Belgian waffle, fried egg, sausage and maple syrup. Breakfast is served until 2pm. 9:30 Hit the shops of downtown. Local shops and boutiques await with treasures for everyone. Antiques, jewelry, art, clothing, home decor and more. Enjoy the barges up and down the river as you stroll Riverfront Park. The paved walking trail is just over a mile and offers stunning views. 11:30 Tour the Cape River Heritage Museum. The museum includes history of the area along with a look back at the way life once was on the banks of the Mississippi River. Open Thursday Saturday. Noon to 4:00pm. Mid-March to mid-December. 1:00 Lunch at Port Cape Restaurant and Lounge located in one of the oldest standing structures west of the Mississippi River. The menu is large and offers everything from loaded salads and sandwiches to gourmet burgers and hickory pit barbecue. 2:00 Soak up the beautiful scenery on a drive to Bollinger Mill State Historic Site. Just 19 miles west of Cape visitors learn how wheat and corn were ground into flour and meal in the massive four-story mill that dates to the Civil War era. Nearby enjoy the Burfordville covered bridge, one of just four covered bridges that remain in Missouri. The rustic setting offers opportunities for picnicking and exploring along the Whitewater River. 3:30 Take one of the local driving tours. If you like history try the Civil War or African American History Tour. Or visit one of the 30 locations used as a backdrop in the 2013 hit movie “Gone Girl”. Rush Limbaugh fans will be delighted to discover the influences of the talk show host, who was born and raised in Cape Girardeau. As you meander through town be sure to check out the murals displayed throughout! 6:00 Dinner at Broussard’s Cajun Cuisine, which opened in 1986 by Barron T. and Kathy Broussard, who moved to Cape from Crowley, Louisiana. They brought delicious cajun recipes and a fun vibe to the area, and it remains a local favorite today. The menu has cajun classics like Étouffée, Jambalaya and Gumbo. If cajun is not your thing, burgers, salads and steaks are also available. Cape Farmer’s Market April 11 - November 14 Cape Farmers Market is an open-air market located on West Park Mall parking lot every Thursday April 11th thru November 14th, noon till 5:00 pm. Locally grown fruit and vegetables, foods, plants, flowers, herbs, baked goods, honey, soaps, syrup, meats, bison, and much more are available. Products are grown or made by the vendor selling them. First Friday with the Arts May 3 Galleries, shops and restaurants are open late the first Friday of every month to celebrate the latest in the local art scene. Special events and themes mix up this monthly event, which runs from 5-9 p.m. Cape Riverfront Market May 4 - October 26 Everything at the Cape Riverfront Market is locally grown and crafted, and people come from across Southeast Missouri to shop the stands. Find your fresh produce, flowers, crafts for your home and organic body products. The market also has a free demonstration every week and live music. The market opens for the season on May 4, and will continue every Saturday through October 26, lasting from 8 a.m. until noon. Air Festival May 18 - 19 Join us for the best air show in the Midwest that has been welcoming thousands of aviation enthusiasts to the area since 1995. This year’s event features the U.S. Navy Blue Angels®, Shockwave, Joe “Rifle” Shetterly, Skip Stewart Airshows, Angel 9 Transam, Dream Photo and the U.S. Golden Knights with more acts being added. but there are some things you need to know before you go. By Mary Ann DeSantis Photography courtesy of Tony & Mary Ann DeSantis. Aerial shots of the ship on the Danube were provided by Viking Cruises. Pork and sausage seasoned with Hungarian paprika are found on most Budapest menus. and at the end of the day cruisers relax in luxury with exquisite meals and impeccable service – where everyone knows your name. The Schonbuhel Castle marks the gateway to Austria’s Wachau Valley. • Take more than one pair of walking shoes. I found it very comforting to switch shoes each day, sometimes more than once a day. For the cobblestone streets, a sturdy pair was perfect, but my feet needed a breather especially in the evenings. I packed three pairs, including Earth Origins walking sandals in the summer. If a winter cruise is in your plans, you may want to take lightweight boots. • The month of August is not an ideal time to go. Crowds in the major cities are overwhelming, the heat can be intense, and river water levels drop, sometimes forcing river cruises to adjust the itineraries. Prices, however, are often lower than peak periods. selection of Slovak wines, including the delicious Alibernet. Grab an outdoor table and people watch. Museum of the Danube Komárno, Slovakia This museum and town were unexpected treasures when our ship was rerouted because of the Danube’s extremely low levels of water. The town center was a great place to have an ice cream and listen to a local street musician. Café Leopold Hawelka Vienna, Austria Books have been written about the Viennese café culture, and it’s a “thing” to while away an afternoon. The secret is finding a café that is not overrun with tourists. We decided to head down Dorotheergasse, a side street off the crowded – and expensive – shopping district of Am Graben. Open since 1945, Café Leopold Hawelka has been operated by three generations of the same family. Only later did I learn the café had been a meeting place for Cold War spies, writers, painters, and actors, including Peter Ustinov and Andy Warhol. Gottweig Abbey Krems, Austria The over 900-year old abbey (founded 1083) is not really off-the-beaten path for tourists, but it’s worth an afternoon of exploration to see the art and learn how today’s Benedictine monks are making a difference. Be sure to taste the Wachauer Marille, a special Apricot jam made only at the abbey. Schönbrunn Palace Vienna, Austria The former royal residence of the imperial Hapsburg family is an amazing walk through history, but be sure to leave time to walk through the spectacular gardens. The palace has an admission fee, but the gardens are free to explore. When people hear “Florida Keys,” they automatically think of the picturesque islands that stretch south of Miami from Key Largo to Key West. However, the Sunshine State has other keys that can be just as much fun as the southernmost ones – and a lot less expensive. By Mary Ann DeSantis Photography credits: Cedar Key Photos: Mary Ann & Tony DeSantis; Perdido Key Photos: VisitPerdido.com; Lido Key/St. Armands Circle photos courtesy of VisitSarasota.com. Not all of Florida’s islands that include “key” in their names are part of the famous coral cay archipelago that forms the southernmost portion of the continental U.S. After all, keys are sandy, low-elevation islands that form on top of coral reefs or sandbars, and can be found anywhere there is a tropical environment. The Spanish called them “cayo,” which means key. We explored several in the Gulf of Mexico and found them to be the keys for unlocking a perfect vacation. If you are looking for something more bustling than just pristine beaches and lush nature walks, head to Lido Key, where you will find more than 140 upscale shops, restaurants, and art galleries in St. Armands Circle. You’ll also discover beautiful beaches within walking distance of the circle. Lido Key is a short drive across the Ringling Causeway from downtown Sarasota and one of six keys along the Sarasota coastline. Greece is the ultimate vacation when you are looking for history, culture, great beaches, and wonderful cuisine. Mapmakers must hate Greece: the country contains approximately 6,000 islands, but only 227 are inhabited. Cruising the isles brings visitors the richness in almost as many ways as there are Grecian dots on the map, including safe turquoise water, sandy beaches, adventure, mystery, romance, and the echoes of mythological Gods. Surprisingly, the trip can be easy on the budget, depending on the cruise company and length of itinerary. All the major cruise lines offer itineraries, but differ in their amenities and island-hopping style. Some move in rapid succession; others spend overnights in idyllic ports. Make sure the line you choose stops long enough at the destinations you want to see. (I picked Celestyal, the economical Greek line that docks overnight in both Mykonos and Santorini. Their schedule allows passengers time to linger for sunset dining atop Santorini’s cliffs or indulge in the famous nightlife on Mykonos without worrying about missing the boat.) All cruiseships provide island tours and excursions to archaeological ruins, beaches or shopping venues. Milos is the kind of spot that excites a traveler: few crowds, mysterious landscape, incredible beaches, and site of the discovery of the famous statue named Venus de Milos. Sarakiniko Beach, one of the world’s most-incredible beaches, was created by a lava flow. Centuries of Mother Nature’s powerful winds eroded the coastline forming mysterious and marvelous shapes. It’s a lunar-like white/beige landscape, like something from a Dr. Seuss book. The ecru colored mounds (not black lava) look like sand but hold firm, not squishy. The swimming water is as clear as any liquid you’d drink. Milos feels magical with colorful little Greek villages, ancient catacombs and panoramic vistas. For the moment, Milos remains a hidden gem. Most cruise ships do not stop there, but the captivating isle is bound to become more popular. Pass your time taking photos, shopping and dining or consider sailing, snorkeling, swimming and hiking adventures. The lava-strewn trails amid steaming volcanic vents and sulfur smells attract hikers to nearby Nea Kameni. History buffs love Akrotiri, the archeological site unearthed in 1967. Sunset cliffside dining ranks as a nightly Santorini ritual – a memory made even lovelier by the sounds of live, traditional Greek music floating in the air. Without question, Santorini is one of the most romantic spots in the world. Back on board the ship, Cretan dancers performed. Cultural entertainment is another added benefit of a cruise. The talented individuals displayed boundless energy and passion with high jumps, kicks, and spins at a dizzying pace. At the end of their performance, the audience joined in. If you follow the PBS series the Durrell’s in Corfu, you will delight in this island stop in the Ionian Sea. Here you can tour the palatial estate and retreat of Empress Sisi, wife of Emperor Franz Joseph, the 19th century monarch of the Austrian-Hungarian empire in Europe. CULTURE & CUISINE Cruising the Greek isles provides an authentic taste of Greek culture, history and, of course, Greek cuisine. Always fresh and flavorful, Greek fare is another reason to visit. Specialties like stuffed grape leaves, tzatziki, spanakopita, Greek salads and a fabulous variety of olives spice up the menu. Fresh grilled fish and seafood are staples accompanied by Greek wine, especially the white Assyrtiko, and the traditional ouzo, licorice flavored liqueur. IF YOU GO Most cruises start and stop in Piraeus, the port nearest the capital city of Athens. Fly into Athens a day or two early to see the priceless antiquities in the Acropolis, Acropolis Museum and National Archeological Museum. Debi Lander, a freelance writer/photographer and avid traveler, writes for AllThingsCruise.com and other publications. She is planning a December cruise to Greece. Her website is bylandersea.com. Fresh from the oven, Christie Cookies are ready to customers at the 12 South shop in Nashville. Along with its popular cookies, Christie Cookie Company also sells brownies. An award-winning journalist, Jackie Sheckler Finch loves to take to the road to see what lies beyond the next bend. What do you really need to take on your next vacation? Not as much as you think! If anyone should know how to pack a suitcase, it’s a travel writer. I’m ashamed to admit that after a decade of writing about getaways across the South and around the world, I am a terrible packer. But I’m getting better. Once upon a time I’d bring everything with me on a car trip, even an overnighter – sneakers and hiking boots and flip flops and a nice pair of shoes, my pillow, extra jeans in case I spilled on the current pair, plus a cooler, my backpack/camera bag, and enough snacks to open my own food truck. Lately I’ve gotten better, more efficient, and on my last trip to New York, I managed to pack for five days in a single Travelpro carry on. So, how does the “I’d better bring seven pairs of underwear for this three-day trip because you never know” packer begin packing like a normal person? Practice and public shaming; plenty of travel writers will chime in on the size and number of your bags, the proper method for packing, and provide you with loads of unsolicited advice. So, in keeping with tradition, here’s some unsolicited packing advice. Toiletries Packing toiletries as a man is easy. I need deodorant, the tiny toothpaste my dentist gives me, my hair stuff and some of my Munson and Brothers Beard Balm. It all squeezes – barely – into that tiny bag the TSA says we can use. The rest of it – Q-Tips, razor, toothbrush – it all goes into a separate bag. Ladies, I feel for you. I watch my wife struggle with paring her product, makeup, and nighttime ritual potions, lotions, oils, and rubs to a manageable number, then try to jam it all into that plastic TSA-approved bag. There’s little I can offer by way of help here, except one thing: ask your stylist for a big handful of shampoo and conditioner samples; they pack easily and have enough for a couple of uses. What to Pack Aside from the essentials – ID and/or Passport, cash, credit cards, essential meds and your phone (of course) – what do you pack? My wife always packs a scarf, one of the giant ones that somehow is both a scarf and a blanket big enough to keep her warm on the plane. I, on the other hand, always pack a book of poetry I genuinely intend to read but never do. Before you start packing, do your recon: check the weather, look at your activities and planned dinners, take a peek at your hotel/Airbnb/cruise ship to see if you can do laundry. All this info will help you figure out how much of what to bring. On our trip to Cambodia, we overpacked because we didn’t look into whether our ship had guest laundry services available. It did, and thanks to jet lag, I was up early and did laundry three times on our trip, meaning we could’ve packed half the clothes we did and still had extra. How to Pack Some swear by the rolling method – roll everything into tight little cylinders and jam them in your bag; the tight roll prevents wrinkles (other than the ones you rolled into the clothes) and allows you to efficiently use the space in your bag. Others are packing cube evangelists, saying packing cubes keep you organized and make packing and unpacking easier. I’ve tried both methods and they both work although they have their drawbacks. What works best for me is a mix of the two. I will pack all my undies, socks, and workout gear into a couple of packing cubes, then roll some items and place others – slacks, my blazer – neatly into the bag. On trips where there are multiple stops – say two days in Budapest before sailing the Danube – I will pack a couple of days of outfits into packing cubes, so when I arrive at my hotel, I can grab my few cubes and be ready to go. Be careful what you pack, though. I’ve seen the TSA dig through a bag to investigate a suspicious nest of wires and batteries buried in a carry on only to emerge holding a personal massager, a situation I think everyone wanted to avoid. Four Travel Must-haves 1. Water bottle For flying, I prefer my Kleen Kanteen or Sigg bottle. Both are aluminum, both have a wide mouth for easy filling, and both are sturdy enough to withstand being dropped or banged around. 2. Charger I carry an Anker PowerCore battery that has juice enough to charge my iPhone four times or my iPad twice. It’s small, relatively light, and has earned a permanent spot in my bag. 3. Carabiners I keep three Nite Ize carabiners attached to my bag. These S-shaped carabiners are handy for attaching a water bottle to my bag, holding hotel window shades in place, rigging up a laundry line, even hooking my backpack to my roller bag for easy transport through airports. 4. Spare ID I keep a photo of my passport stored securely on my phone and also in the cloud. I figure if my passport was stolen, I’d be able to speak with local police, provide ID on my phone or a computer, then get to a US consulate and (hopefully) ease the process of securing a new passport. As the author of three travel guides for Moon Publications, Jason Frye has traveled the world. When he’s not on the road, he’s writing from his Wilmington, North Carolina, home. Pam Windsor is a Nashville-based journalist who writes about music, travel, food, culture, and extraordinary people. Seasonal fruits keep mojitos fresh all year long at The Gulf in Orange Beach, Alabama. It all started with kumquats. Victor Bobu, bar manager at The Gulf restaurant and bar in Orange Beach, Alabama, always mixed regular mojitos for his customers, a Cuban drink made with rum and muddled mint. But when a local resident brought him kumquats he decided to do something different. He created a kumquat mojito. The experience got him thinking. The restaurant used fresh berries in its desserts so he wondered if berry mojitos might be the next step. After all, fresh kumquats aren’t in season that long, neither are berries, so a seasonal mojito seemed like the perfect move; rotating fruit for the drink might keep the fruit mojito in business all year long. Which is exactly what happened. “And it went crazy from there,” Bobu said. Bobu now serves 35,000 mojitos each year at The Gulf, and the drink’s ingredients always depend on what’s in season, he said. His fruit drinks include the required fresh mint, Bacardi rum and whatever’s fresh at the market, which has included strawberries, blueberries, raspberries and blackberries. And each drink is created new. “There’s nothing out of the bottle,” he said. Except for the alcohol, of course, which means Bacardi. It’s a fitting cocktail for The Gulf, a unique casual complex created from 28 renovated ship containers that includes a bar, restaurant and gift shop with lots of outdoor seating all facing the warm waters of the Gulf of Mexico. In addition to the Orange Beach location, there’s one on Okaloosa Island in Florida. Both daily drink specials and the food menu are posted on a chalk board, changing up regularly. The restaurant serves Gulf-caught seafood, raw items such as oysters and regional produce, keeping with the farm-to-table objectives. “Our food menu changes every day or almost every day,” Bobu said. 8-10 fresh local ripe blueberries 4-6 mint leaves 3 lime wedges 1/2 ounce sugar cane simple syrup 1.25 ounces Bacardi Superior Rum 3 ounces of club soda Directions: In the mixing glass, combine the blueberries, mint leaves and limes, reserving a few of each for garnishes. Add the sugar cane simple syrup and muddle the mixture. Add a scoop of ice and the rum and give it a couple good shakes. Add the club soda to the mix, pour into a cocktail glass and garnish with the leftover fresh berries, a lime wedge and a few mint leaves. Cheré Coen is a freelance food and travel writer living in Lafayette, Louisiana, but her Mississippi roots run deep. Read her quirky stories at WeirdSouth.blogspot.com. exploring events | APRIL Spirits of the Passage: The Story of the the Transatlantic Slave Trade Through August 11 Two Mississippi Museums Jackson, MS Explore rare, firsthand accounts of loss and resilience from the unlikely discovery of a sunken slave ship. For more information visit twomississippimuseums.com/spirits. 44th Southern Heritage Pilgrimage April 5 - 7 Aberdeen, MS Ten magnificent Antebellum and Victorian homes will be available for touring. Cemetery Tours, Storytelling, Carriage Rides, Proper Tea and many other events are scheduled for a weekend of fun. For more information visit aberdeenpilgrimage.org or call 662-369-9440. Natchez Spring Pilgrimage Through April 19 Natchez, MS Natchez, established in 1716, has more than 600 examples of Antebellum Architecture. During Pilgrimage seasons more privately owned historic homes open their doors than any other time of the year. For more information or tickets visit Natchezpilgrimage.com or vitinatchez.org. Art in The Loop April 5 - 7 Ridgeway Loop Road Memphis, TN ArtWorks Foundation presents its 2nd annual edition of Art in The Loop featuring works in metal, glass, wood, clay, & fiber, as well as 2-D disciplines. You’ll also enjoy the fare of the town’s top food trucks, and performances of classical music by area youth ensembles. Art in The Loop will take place on Ridgeway Loop Road (between Briarcrest Avenue & Ridge Bend Rd.) For more information visit artworks.foundation or artintheloop.org. Art Wine & Wheels Weekend. Over the past eleven years, this exciting weekend in Ridgeland has grown to include fine arts and wine festivals with live music and great food, a 5K race, and a bicycle ride that brings in thousands of folks from all over the U.S. and the world. All the fun takes place at the beautiful Renaissance at Colony Park. For more information and event schedule visit ridgelandartsfest.com. Death Cab For Cuties April 7 Orpheum Theatre Memphis, TN 8:00pm For more information visit orpheum-memphis.com or call 901-525-3000. 3 Blind Wines April 12 DeSoto Arts Council Hernando, MS 6:00pm - 8:00pm 3 Blind Wines is a team competition to crown Desoto’s Top Wine Connoisseur. For more information visit desotoarts.com or call 662-404-3361. Cedar Hill Farm Annual Easter Egg Hunt April 13 - 20 Cedar Hill Farms Hernando, MS Enjoy a day at the farm; riding ponies, petting the animals, face painting and getting pictures made with the Easter Bunny. Egg hunts run continuously throughout the day. For more information visit gocedarhillfarm.com or call 662-429-2540. 50th Annual Crosstie Festival April 13 Cleveland, MS The Annual Crosstie Arts and Jazz Festival, a juried fine arts show, will feature hundreds of exhibitors displaying paintings, sculpture, pottery, fabric and paper designs, handmade furniture and jewelry. Extensive area just for children, live entertainment, a delicious variety of regional foods and more! For more information visit crosstiefestival.com. 14th Annual Mudbug Bash April 13 Panola Street Hernando, MS 6:00pm-11:00pm It is a festive Southern-styled outdoor event filled with great food, libations, live music and the spirit of hope. Mudbug Bash benefits the Palmer Home for Children, a non-profit organization providing stable homes for children with inadequate family structure. For more information, call 662-328-5704 or visit palmerhome.org. Olive Branch Old Towne Easter April 20 City Hall Parking Lot Olive Branch, MS 11:00am-1:00pm Bring the children to Olive Branch Old Towne for photos with the Easter Bunny, games, inflatables, prizes, musical entertainment and so much more! For more information, call 662-893-0888 or email director@olivebrancholdtowne.org. Bonne Terre Country Inn Easter Brunch April 21 Bonne Terre Country Inn Nesbit, MS 10:30am-2:00pm Celebrate Easter Brunch at Bonne Terre with fabulous food, a kids cakewalk, an Easter egg hunt and photos with the Easter bunny. Call 662-781-5100 for reservations. For more information, visit bonneterreinn.com. Southaven Springfest April 23 - 27 Snowden Grove Park Southaven, MS Great entertainment, carnival midway including a variety of kiddie, major, and spectacular rides, games, great concessions and more. For more information visit southaven.org or call 662-280-2489. Greenwood Gravel Grind April 27 Greenwood, MS Join us on Saturday, April 27, 2019 for an off-road cycling tour of the “Most Southern Place on Earth”. 50K & 100K options. Mega party at Tallahatchie Flats afterward. Register at greenwoodgravelgrind.com. Call the Greenwood Leflore County Chamber of Commerce at 662-453-4152 for more info. 4th Annual Sultana Disaster Conference April 27 Trinity in the Fields Anglican Church Historic Courthouse Square Marion, AR Featuring a full day of local and regional noteworthy historical lectures. Tour the Sultana Disaster Museum. For more information visit sultanadisasterconference.com. Santana April 27 BankPlus Amphitheater Southaven, MS 8:00pm For more information visit livenation.com for more info. the choice, they chose to go into the city, not wanting to miss what they had come to see. I suppose the world will always find a way to interrupt the life we are living. For the good or bad, these moments change us. This moment was the closest I had ever come to terrorism, but as long as I travel, I’m guessing it won’t be my last. Even though there was an air of uneasiness looming that day, among other emotions, I felt safe. I also felt gratitude to those who stood with guns drawn, opening doors of uncertainty, in an effort to protect those they didn’t know. I mourned for those who would not go home that night, and I felt anger for a stranger’s senseless actions that had trickled all the way down to me—a woman from Georgia who was a passenger on a river cruise along the Rhine River in Europe. And then I remembered Wolfgang and Reginald and their enriched and accomplished lives, and I felt inspired. What would their lives have been like had fear stopped them in their tracks when bombs fell from London’s sky? The unseen places. The untold stories. I choose to go. A tad bit of fear promises to keep me on my toes, but I will not let it lead the way. I choose the enriched life that only walking off the boat and into the city guarantees. Judy Garrison is a freelance travel journalist and photographer from Athens, Georgia. Known as Seeing Southern, she travels the world in search of the story behind the story. Follow her travels at seeingsouthern.com.